Reel Fast Tackle wanted to move from a home designed GoDaddy website to a new e-commerce platform that allowed them to manage their own content and grow their business. The new website must be a responsive website that will work on any device. Since Reel Fast Tackle was using a design that was outdated and didn't serve the needs of their business. We made discussed their business and where they wanted to be today and in the future using our website discovery. During this phase, we determined Reel Fast Tackle also needs integration with a credit card processor, PayPal and shipping rate calculator. 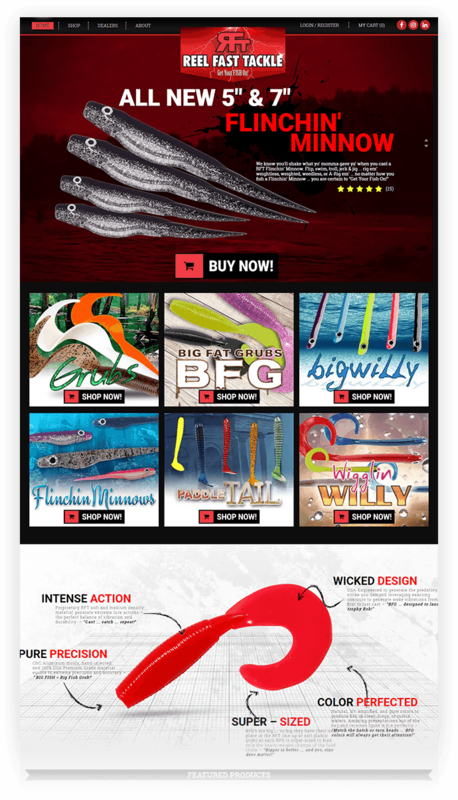 The new website design allows Reel Fast Tackle the ability to manage products and orders quickly and easily reducing customer service calls. Payments are immediately transferred to their account without waiting anymore and shipping rates are calculated so the customer pays the exact amount saving both Reel Fast Tackle and the customer time and money.